L-r, Jonah Hill, Rhianna and Christopher Mintz-Plasse star in Columbia Pictures’ “This Is The End.” ©Columbia Pictures. HOLLYWOOD—With the release of the raunchy sci-fi comedy, “This Is the End,” in which actors Jonah Hill, James Franco, Michael Cera, Emma Watson, singer Rihanna and other popular performers play fictional versions of themselves, it made me think about other feature films in which people—primarily actors—have played themselves or heightened versions of their public personas on screen. As the fascination with celebrities’ personal lives continues to permeate pop culture, here are some other films in which real celebrities have played themselves—or, at least, heightened versions of themselves. Number one on the list is “Being John Malkovich.” This 1999 fantasy comedy, written by Charlie Kaufman, featured John Cusack as a puppeteer who found a portal into the eccentric actor’s brain. 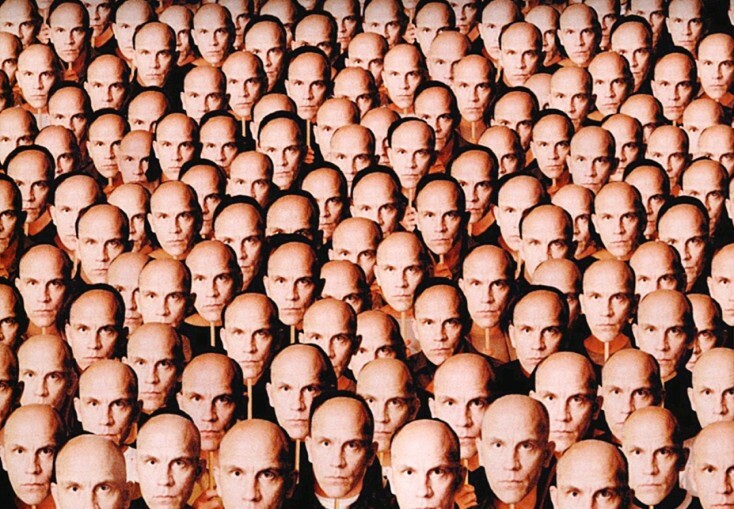 Malkovich played a crazier, more paranoid version of himself. Speaking of Kaufman, the renowned scribe injected himself into an adaptation of Susan Orlean’s “The Orchid Thief,” in which the main character (named Charlie Kaufman) struggled to write the screen adaptation of that book. He also made up a fictional twin brother named Donald, whose antics added to his writer’s block woes. Nicolas Cage played a version of Donald and Charlie (who does not appear in the 2002 film). Kaufman not only clinched an Oscar nomination for the film, titled “Adaptation,” but his fictional brother did as well. In a weird case of art imitating life, celebutant Paris Hilton plays her ripped off self in the ripped from the headlines drama “The Bling Ring.” You’d think she wouldn’t want to publicize the fact that she has a bad habit of forgetting to lock her doors. Who else but Howard Stern could play the inimitable “shock jock” in his autobiographical “Private Parts” based on his bestselling book. Though 20 years older than character he depicted, Stern pulled that characterization off. The 1997 comedy also introduced the world to versatile character actor Paul Giamatti, who played Kenny “Pig Vomit” Rushton, an amalgam of Stern’s early program directors. Going way back in cinema history, decorated World War II army hero Audie Murphy played himself in an adaptation of his autobiography about his war experiences in 1955’s “To Hell and Back.” It was filmed in Cinemascope. The ubiquitous Neil Patrick Harris was on a wild strange trip as drug-loving version of himself in all three “Harold and Kumar” movies. I purposely am not including documentaries involving celebrities including “Searching for Debra Winger” or “My Date with Drew” Barrymore because they don’t really fit the meta movie criteria.